PARC Bushings carries the largest inventory of new and used high-voltage transformer bushings. If you need it, we've got it and we'll get it to you with the fastest turnaround. From the experts you know and trust: PARC Bushings has grown out of parent company Power Asset Recovery Corporation, the power transformer experts. Many of our repeat customers have help spawn our accessory business. We hope to earn your business the same way we have earned other utilities'. Fabricating adaptor flanges to raise the bushings making the dimension below the flange shorter and changing the bolt hole configuration simultaneously when required. This is used primarily in bottom connect applications. Cross referencing bushings to ensure that a newer style of bushing will apply in place of an obsolete model. Expedited freight options whether it be by air, sea, or land. 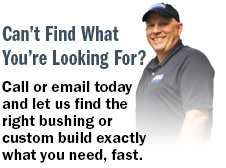 Our extensive inventory of bushings for power transformers is available 24/7. Entergy lost several 15 KV 2000 AMP bushings over a summer peak and found the exact replacements in PARC stock. They were airfreighted overnight.